This is the brutal logic of trade wars at work. Prime Minister Justin Trudeau shakes hands with Chinese Premier Li Keqiang (right) at a news conference in Beijing, Dec. 4, 2017. Canada is planning new tariffs and quotas on steel from China and certain other as-yet unknown countries, according to a news report. Experts often say that trade wars can spread easily — and here's an example from right here at home in Canada. The federal government is planning new tariffs and quotas on steel from China and certain other as-yet unknown countries, according to a report at Bloomberg news service. But this isn't the result of some new protectionist streak among the governing Liberals — it's the outcome of the brutal logic of trade wars. Canada is trying to to prevent the dumping of Chinese steel on the domestic market in the wake of the Trump administration's steel tariffs. 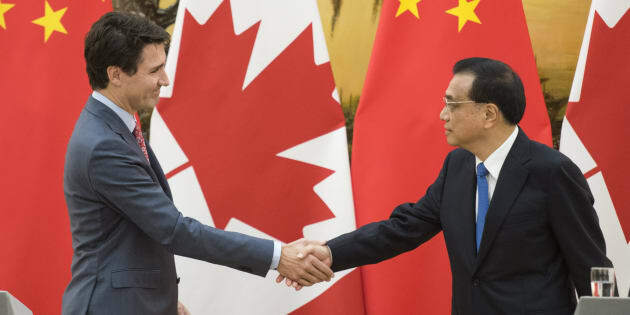 Along with the European Union, Canada is concerned China could engage in "dumping"; steel that was meant for the U.S., now with no buyer, could instead be sold below cost in Canada or elsewhere. A spokesperson for the federal Department of Finance declined to comment on the report, but noted in an email to HuffPost Canada that the government has already taken steps to protect Canadian steelmakers from the possibility of aggressive competition in the wake of a trade war. Among other steps, the government announced earlier this year it is beefing up Canada Border Services Agency''s budget, adding 40 new officers to handle trade-related complaints. "Canada is a trading nation, and we will not allow North American industries to be hurt or threatened by unfair trade practices, like the diversion of steel and aluminum," Prime Minister Justin Trudeau said in March. At that time, Canada was exempt from the U.S. steel and aluminum tariffs, making it a distinct possibility that Chinese and other exporters would use Canada to access U.S markets. Trudeau vowed Canada would not be "used as a backdoor" into the U.S. But with tariffs now in place on steel going to the U.S., the focus has shifted to protecting Canadian manufacturers from aggressive competition from abroad. Sean Donnelly, the CEO of AercelorMittal Dofasco, Canada's largest steel producer, told lawmakers on Tuesday that there has been a rise in steel diversions to Canada in recent years, even before the Trump tariffs took hold. "Canada's response to past and future threats from unfairly traded and diverted offshore imports is critical," Donnelly said. Citing "people familiar with the plans," Bloomberg said Canada is preparing quotas that would limit the amount of steel imported into the country, with tariffs charged on any imported steel beyond that quota. The new tariffs and quotas could be announced as soon as next week, the report stated.